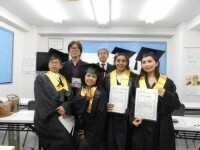 【募集〆切】無料で介護士になるための資格を取得できます！【Closed】The FREE training to get the qualification to become care giver!! *We closed our list because it reached its capacity. The FREE training to get the qualification to become care giver!! Because of ageing, Japanese society deadly need caregivers. To work as caregivers, it is good to take the qualification in advance. You can get the qualification at I-Helper school which has lots of experiences to teach foreign residents already. Why not join us? We are very looking forward to seeing you soon. ・NPO TAKASHIMADAIRA ACT and NPO APFS will start the project “Total support for foreign residents to become independent” by getting subsidy from WAM (Fukushi Iryo Kiko). So that the cost of Training is totally free! Please contact to TAKASHIMADAIRA ACT for interview. After the interview, we decide whether you can take the training or not.